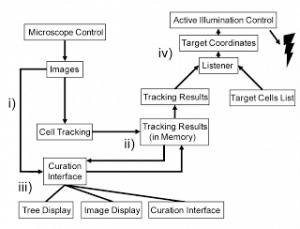 Until now automated cell tracking has been used primarily as a post hoc observational tool. By processing 3D images of developing tissues in real-time, as each one is acquired, ShootingStar enables us to manipulate cells with pinpoint accuracy. Using ShootingStar we can use a pulsed laser to automatically kill specified cells as soon as they are born, or use a violet laser to tag an individual neuron expressing a photoconvertible fluorescent protein to track its outgrowth and development in the nervous system. ShootingStar scales beyond the worm and is capable of processing 3D images containing thousands of cells in real time.